After fifteen years of economic transformation, Moldova still remains a mostly agrarian country. The industrial sector is only successful in connection with agriculture (such as the production of food or beverages). The country's agrarian structure seems to be a legacy of Moldova's former role in the division of labour within the Soviet Union. 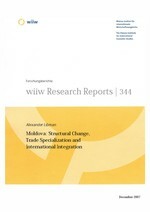 Although the absence of the 'resource curse' facilitated Moldova's relative success in economic and political institutional reforms, there are still significant drawbacks in the quality of the economic order which prevent the institutional factor from compensating the 'geographical' deficits. An additional problem is the Transdniestrian conflict, which has resulted in the existence of a 'split state' and a 'split society'. High labour emigration in the wake of rising poverty, deficits of the labour market and the advantages of social integration within the post-Soviet space have a twofold effect on economic transformation: they reduce internal demand and workforce potential, but also create a permanent and significant inflow of migrants' transfers and establish opportunities for learning effects. Moldova's geographical structure of trade is still dominated by the CIS. The European vector of its foreign trade remains underdeveloped, partly because of EU agricultural trade restrictions, but to a great extent because of internal trade barriers. Moldova's major comparative advantage (with respect to both the CIS and the EU, as well as globally) lies in agricultural production - food, beverages, tobacco, animal and vegetable oils - which is reflected in a very low diversification of exports. Imports are by far more diversified; the major imported goods are fuels, machinery and equipment. The energy intensity of the Moldovan economy makes the country extremely dependent on Russian gas and oil. In order to achieve positive structural shifts and move away from agricultural specialization, Moldova needs to continue economic and political reforms and improve the quality of the investment climate in order to attract FDI. A peaceful resolution of the Transdniestrian conflict is of vital importance from the point of view of investment risks. Further consolidation of democracy could help to reduce rent-seeking and state capture (which is still very high in the republic). The evolution of the Communist administration since 2001 has been very promising in this respect. Moldova seems to be a natural benefactor of 'open regionalism' solutions in the Eurasian space, which could give it an opportunity to simultaneously improve its trade relations with the EU, the CIS and Southeast Europe. The EU Neighbourhood Policy could act as a trigger for internal reforms and as a factor of external re-orientation (if major problems such as Transdniestria could be resolved). On the other hand, Moldova could benefit from a redesigning of post-Soviet integration to make it compatible with the Western vector of integration, reduce political aspects of the 'protective integration' currently inherent in the CIS and similar groups, and focus on the opportunities of open regionalism solutions.